New Delhi: Actor Salman Khan's petition for suspension of his jail term will be heard on July 17. The actor appeared in a trial court in Jodhpur today. He had challenged his five-year jail sentence for killing endangered blackbucks in 1998. The 52-year-old star arrived last night in the city with his sister Alvira Khan, friend Baba Siddiqui and lawyers. 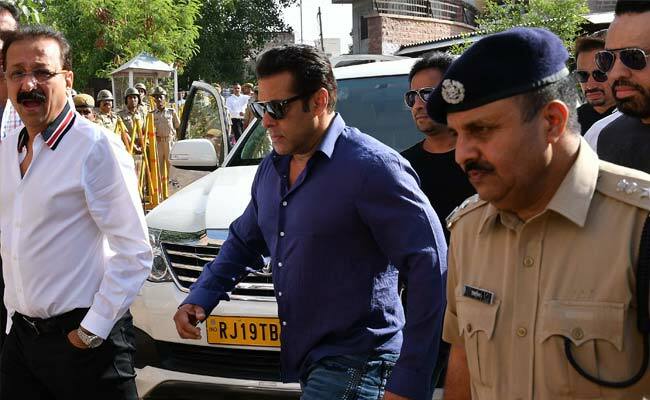 The actor is out on bail after he was convicted on April 5 for hunting blackbucks, while on a location shoot of the multi-starrer Hum Saath Saath Hain. Salman Khan's co-stars Saif Ali Khan, Neelam, Tabu and Sonali Bendre were acquitted on account of lack of evidence. Salman Khan spent two nights in the Jodhpur central jail after being sentenced to five years in prison. The actor has been allowed to travel abroad by the court from May 25 to July 10; he is scheduled to visit the US, Canada and Nepal for a film shoot. After his return to Mumbai on April 7, Salman Khan thanked fans, friends and family for standing by him. "Tears of gratitude. To all my loved ones who are with me and never lost hope. Thank you for being there with all the love and support. God Bless," he had tweeted. On April 21, a trial court in Mumbai cancelled a bailable arrest warrant against the actor, in the 2002 hit-and-run case, in which the Maharashtra government's appeal against his acquittal is pending before the Supreme Court. On April 23, the Supreme Court stayed criminal proceedings against Mr Khan, in cases lodged in various courts in the country for allegedly making derogatory comments against the 'Valmiki' community members during the promotion of his film 'Tiger Zinda Hai'. Both Judge Ravindra Kumar Joshi and Magistrate Dev Kumar Khatri who gave him bail in early April, have since been shifted as part of a mass transfer that was described as routine.